« Reflections: Part 3, Right Where I Need to Be. The End. My son is becoming more independent. Which is wonderful, as every extra minute he occupies himself means more time to accomplish small tasks, like washing dishes, cooking, baking, sweeping, and so forth. For the last month or so he has not been very enthusiastic about the studio playground, and has shown little interest in his sand box, trucks, blocks, toy mower, or drawing. Unfortunately, we often left the studio, my favorite place, after just a few minutes. However, lately he has developed an interest in making “messes” with sand. 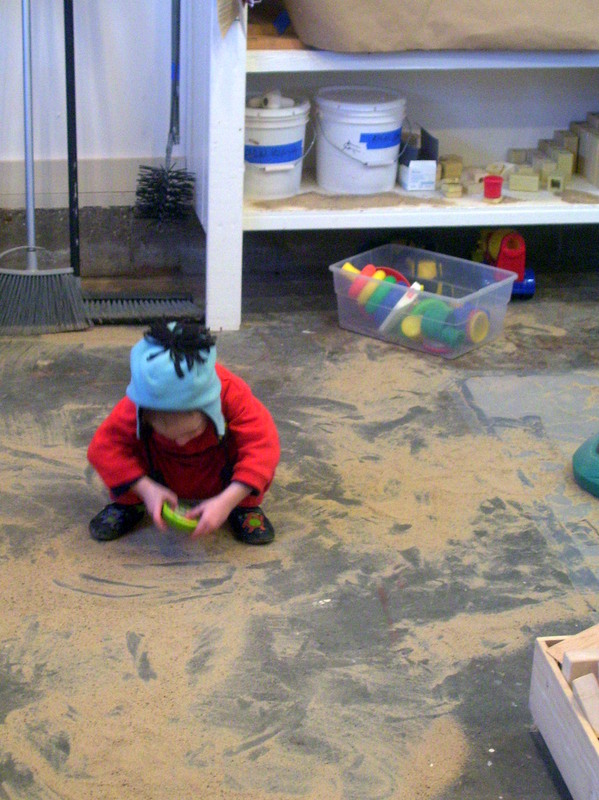 He will spend up to fifteen minutes or more, spreading sand over the floor, on shelves, in buckets, and in random places throughout the studio. Normally, I am annal about having a clean and orderly studio, although, when he is making “messes” I let him go, and deal with the destruction later. If I am quiet, I can draw or read while he is sand-drawing and he might not notice me for some time. This is great, because, I can actually get a little bit accomplished. Occasionally, he will want me to help him clean up one of his creations so that he can start over anew, I willingly oblige him. The hardest part of my parental role is having patience for studio time. I have all but given up on the possibility of working on art during the day. I work at night and during the weekends when my wife can take care of our son. However, when he is creating sand messes, I refer to them as “zen gardens”, I might be able to read an article or place a few lines on a drawing. It gives me hope that one day we will be able to work independently for an extended period of time. In the mean time, I enjoy watching him experiment with his world and try to give him as much freedom to play and create as possible. This entry was posted on February 28, 2010 at 6:33 pm and is filed under Art, Reflections. You can follow any responses to this entry through the RSS 2.0 feed. You can leave a response, or trackback from your own site.